Kolkata, Sept 13 (IBNS): Xiaomi recently launched three phones in India, Redmi6 , Redmi 6A and Redmi pro. 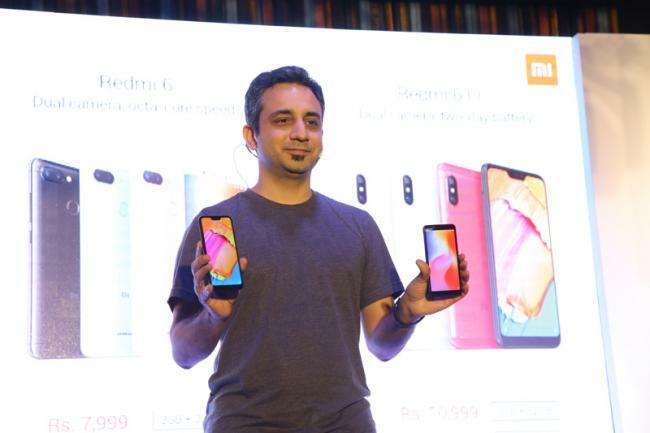 Anuj Sharma, Chief Marketing Officer, Xiaomi India, said the phone has dual volte and dual standby mode. In Redmi 6, you will get Android Oreo 8.1 MIUI. It has a 5.45 inch full screen HD display. The phone has an octa-core helio P22 processor 3GB/4GB Ram which may be increased to 256 GB storage. Redmi 6A has a 13MP rear camera featuring autofocus with electronic image stablilization and a 5MP front camera. Redmi 6A features AI face unlock for fast unlocking. It runs MIUI 9.6 based on Android Oreo but an update to MIUI 10 is likely in the coming months. Redmi 6A comes in two variants, 2GB/16GB storage is 5,999 and 2GB/32GB is 6,999 as introductory price for two months. Redmi 6 pro is a qualcomm snapdragon 625 octa-core processor. It pairs an AI dual camera along with 4000mAh battery to deliver a two day battery life. Redmi 6 pro has 12MP / 5MP dual cameras with 1.25m pixel size. Redmi 6 pro comes with MIUI 9.6 out of the box based on Android Oreo, with an update to MIUI 10 due in the coming months. Redmi 6 pro 3GB/32GB is priced at 10,999 and 4GB/64GB is priced at 12,999. The phones come in four colours -- black, gold, rose gold and blue. Redmi 6 will go on sale September 10, and Redmi 6 pro on September 11. Redmi 6A will appear in the market on September 19 at 12 noon on mi.com and amazon.com.